PATNA: Was Giriraj Singh, firebrand BJP leader and Union Minister of State for Micro, Small and Medium Enterprises, really not aware about the party leadership’s move to gift his Nawada seat to its ally or he developed cold feet after watching powerful JNU Student Union leader Kanhaiya Kumar in the poll fray? What has raised this question is the statements by LJP chief Ram Vilas Paswan that his party staked claims over the Nawada seat only after obtaining Singh’s consent. Singh currently represents Nawada seat in the Lok Sabha but now has been shifted to neighbouring Begusarai after the Nawada was given to LJP under the seat sharing deal. “When I discussed the issue with Giriraj Singh sometime back, he spoke in the affirmative saying he doesn’t want to contest elections anymore and wants to serve the society,” Paswan told the media on Tuesday. 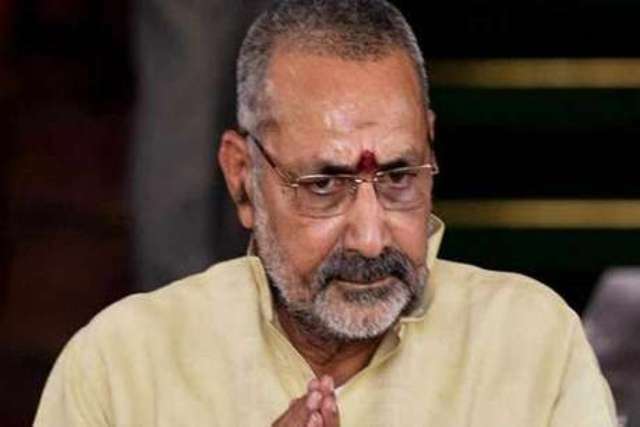 “Recently when Chirag Paswan called him (Giriraj Singh) up over the issue, he said he has no objection over it,” Paswan explained adding the LJP had told the BJP long back that his party would not stake claim over the sitting seat of the BJP. Chirag is son of Paswan. If the statements of Paswan are any indication, Singh must have another reason for his refusal to shift to another Bhumihar-dominated Begusarai seat. Giriraj scared of facing Kanhaiya in poll arena? Experts say the minister perhaps finds his chances doubtful with Kanhaiya joining the poll fray in Begusarai as a CPI candidate. According to them, for the past several months, the student leader has been campaigning in the area and meeting the voters. His frequent meeting with people of Begusarai, also his home district, has to a certain extent helped weaken the treason charges against him in connection with which he even was sent to jail, many feel. And, it’s this change in situation which has kept the minister worried. Secondly, Singh perhaps fears sharp split in the Bhumihar votes in this constituency which could seal his fate in the elections. “These factors, perhaps, might have forced Giriraj Singh do a rethink and contest from Nawada again,” said a political expert. As a last hope, he rushed to Delhi and brought the matter to the notice of top party leaders but they too were of no help. Instead, BJP chief Amit Shah told him to contest from the new seat and even turned to twitter to clear any doubts over change in his constituency. “Giriraj Singh will be contesting from Bihar’s Begusarai. I have listened to all his grievances and the party organisation will sort out all his issues. I wish him all the best for the elections,” Shah tweeted in Hindi. That mean Singh will have no other option other than contesting from Begusarai seat. He is obviously caught in a critical situation in the sense that his reluctance to fight from this seat will not only be treated as only defying the party decision but also the fact the he is scared of facing Kanhaiya in the poll arena. Kanhaiya Kumar, enjoying the discomfort of the seasoned politician, on the other hand, has taken potshots at minister’s behavior, comparing it to a kid’s refusal to attend school after failing to complete his homework.